Key Difference: In today’s context, sauce refers to a liquid or a semi-liquid substance that is served with food or added in many dishes to add moisture and flavor. 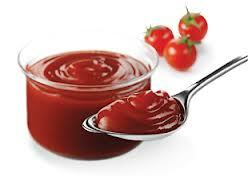 Ketchup is a sauce that is mainly used in context to a sauce made from tomatoes and is used as a relish. Sauce and ketchup are mostly used as condiments. They are widely loved because of their texture and taste. You can use these sauces with chips, breads and also use them as ingredients while making some dishes. These words are used quite differently in various countries, and therefore the confusion has further intensified. To understand the original meanings of these words lets glimpse on the historical facts and beliefs related to sauce and ketchup. Sauce is derived from Latin word salsas meaning “salted.” Food historians believe that sauce was "invented" for many reasons like it served the purpose of a cooking medium, it was looked as a meat tenderizer and it had the capability of enhancing the flavors. Still, the ingredients, composition and preparing methods differ from culture to culture. Therefore, no particular recipe and methodology is followed while preparing a sauce. For example, Soy sauce is made from ingredients like boiled soybeans, roasted grain, brine, etc, whereas Aioli is a thick garlic sauce. It can be used in cold as well as hot form. Sauces have their importance place and every culture has some indigenous recipes for sauces. Sauces also have a big commercial market. Many people also make these sauces at home. The sauces can be of various viscosities as it depends upon the primary usage of that particular sauce. 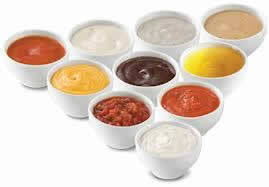 A sauce that is used as a cooking medium may have less viscosity than the sauce that is used for dressing. It all depends upon the taste and likings of an individual. Ketchup word is considered to be originated from Chinese koechiap "brine of fish”. It is supposed to be originated in the seventeenth century. It was originally related to a sauce that contained fish brine, herbs and spices as main ingredients. In eighteen and nineteenth century, the term was used to refer all the sauces with vinegar as one of the ingredients. Later at some point of time, it got associated with tomatoes juice and since then, the term got popularized for tomato sauce. Ketchup can also be referred as a spicy sauce that is made using tomatoes and vinegar. It is mainly used as a relish. It is generally served cold. The word Ketchup has undergone several definition changes, therefore it is difficult to associate it with a particular definition. However, today we generally associate it with a tomato sauce. One of the famous characteristics of ketchup is its viscosity, and thus pouring it on a plate is sometimes difficult and can also be fun at the same time. Therefore, we can say that a ketchup and a sauce were same in earlier times, but in modern times, a tomato sauce is specifically considered to be a ketchup.